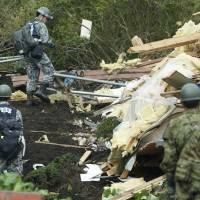 SAPPORO - The number of people dead or in a critical condition in Hokkaido following a powerful earthquake has risen to 18, Chief Cabinet Secretary Yoshihide Suga said Friday, amid fears the figure will continue to grow. There have been 9 confirmed fatalities, while 9 others are in cardiopulmonary arrest, the government’s top spokesman said. Another 22 people are still missing. 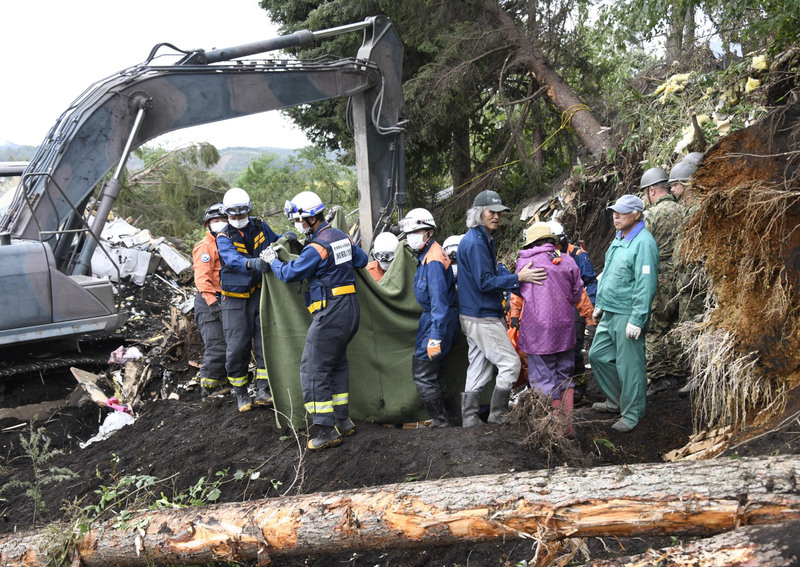 In the town of Atsuma, where massive landslides buried a number of homes, police, firefighters and Self-Defense Forces personnel searched manually and used heavy machinery to dig through rubble. 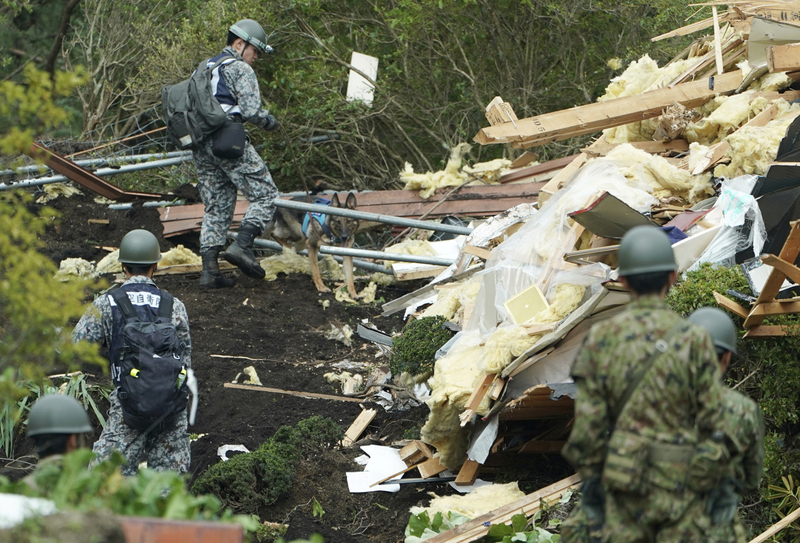 All of the missing people are located in Atsuma, according to the government. 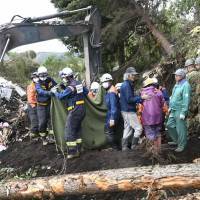 Heavy rain is expected in Hokkaido through Saturday and the Meteorological Agency warned of more mudslides, saying that aftershocks of a similar intensity to Thursday’s quake could occur again in the region. More than 100 smaller temblors have been recorded in the region since the early Thursday morning quake, according to the agency. 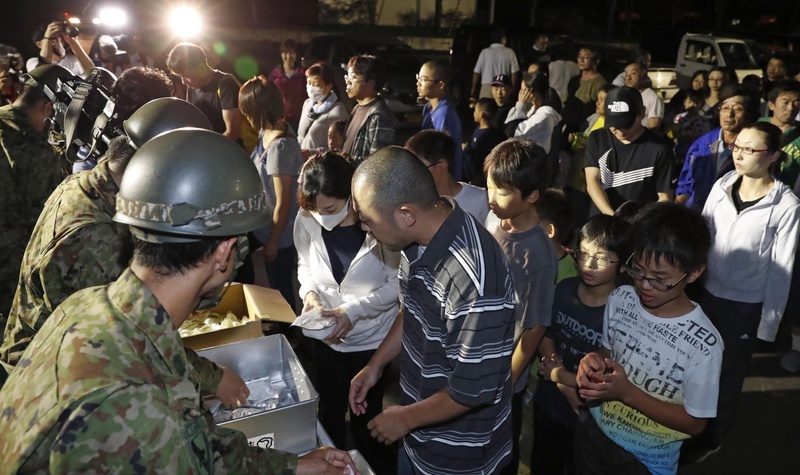 The magnitude 6.7 earthquake, which left over 300 other people injured, caused a prefecture-wide blackout and left many homes without water, while over 10,000 people were forced to spend the night at evacuation centers. “I have been living in Atsuma all my life but I have never experienced such a quake. I came here because I am scared of aftershocks,” said Toyokazu Kurashige, 79, who was staying at the evacuation center with five family members. 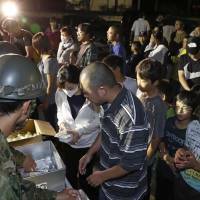 Kurashige was among more than 100 residents of the hard-hit town who took refuge in a shelter adjacent to the town office. The facility had no running water, and evacuees slept under blankets on thin mattresses in an open space without any partitions. The quake registered at the highest reading of 7 on Japan’s seismic intensity scale in Atsuma and an upper 6 in the neighboring town of Abira, both southeast of Sapporo. Smaller aftershocks have continued in the prefecture. Power had been reconnected Friday for 1.4 million households — about half of the total affected — and is expected to be restored to another 1 million homes later the same day, but it may take about a week until the supply is fully re-established, according to the industry ministry. Industry minister Hiroshige Seko urged homes and offices already with power to limit their use as much as possible. Water supplies were cut off at some 66,587 households at its peak but the figure had dropped to 38,300 as of 5:30 a.m. Friday, according to the health ministry. People formed long lines at emergency water stations set up in many areas. The ministry also said 191 hospitals were still without power and 51 were without water Friday morning. Transportation is slowly becoming available in the region, with some train and air services expected to resume during Friday. Hokkaido Railway Co. said it was restarting its bullet train services to and from Hakodate and a train bound for Hokkaido left Tokyo on Friday morning, but the operator canceled its express trains for the day. 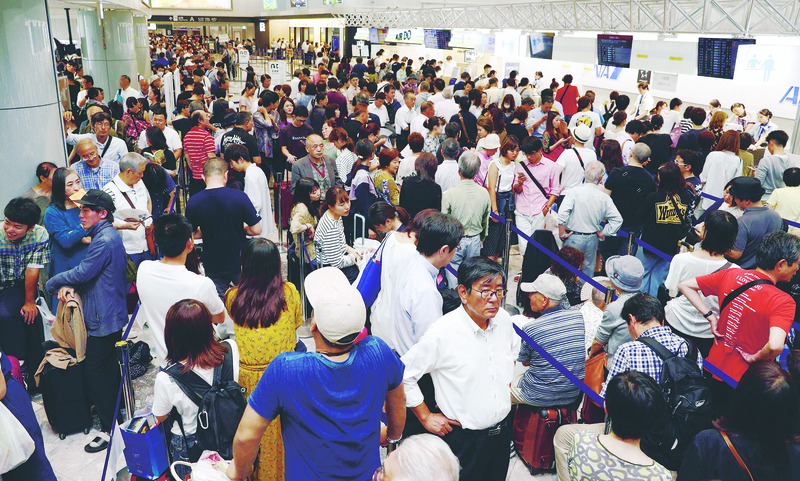 New Chitose Airport, the main gateway to Hokkaido, also restarted domestic arrivals and departures, although many people were unable to secure seats. “I was told all the flights are booked. 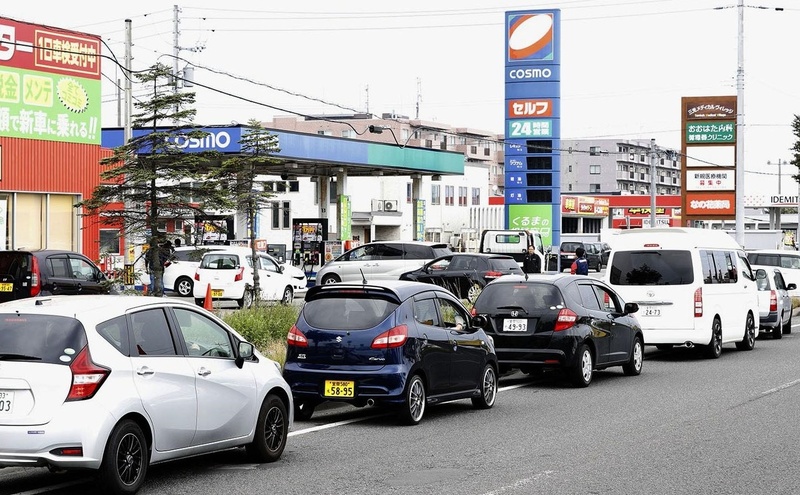 I’ve done everything I can but there is no way I can get out of Hokkaido,” said Masahiro Torimoto, 49, who was scheduled to travel to Fukuoka to take part in a national softball tournament. More than 100 flights to and from the airport scheduled for Friday were canceled, affecting more than 17,000 people, according to airlines. 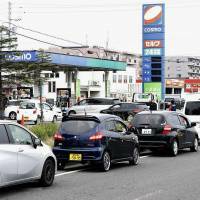 In Sapporo, a city of some 1.96 million residents, neon and traffic lights were out Thursday night and parts of its road system had caved in, while long lines formed in front of a limited number of convenience stores and gas stands that had reopened. “I can’t use anything at my all-electric home. I can’t even flush a toilet so I have to use my neighbor’s,” said a 39-year-old woman in the city. Garbage collection in the city was canceled for the day, with the city government saying it had been unable to secure fuel for garbage collection vehicles.